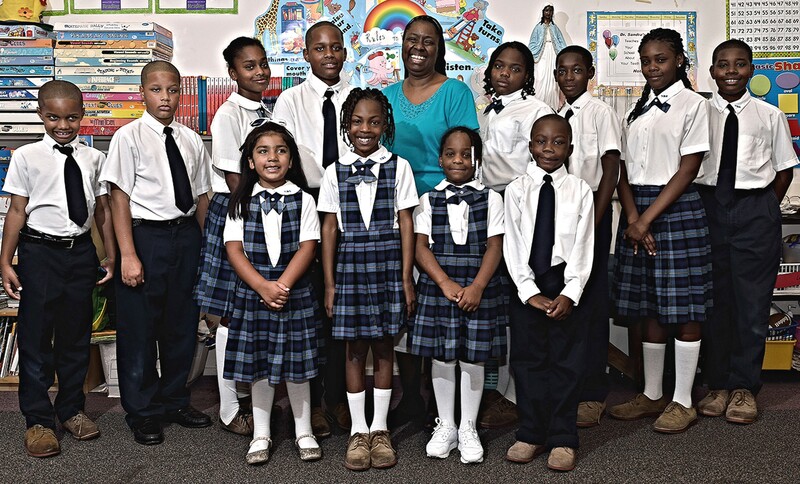 Students shown with Sister Donna Banfield, Principal of Norte Dame Academy. Notre Dame prides itself of its small classrooms and intimate settings, with the student/teacher ratio at 12:1. This ratio is to ensure that each child receives the individual attention that he or she needs to excel academically and become a productive citizen. Notre Dame provides an intense academic program for students as a way to prepare them for the future challenges they will face in life. The school works hard to make sure that each student gets a solid education. Its curriculum is based on the four purposes of Catholic education: message, community, worship, and service. In a climate that is closely controlled and beneficial to the learning process, Notre Dame offers activities that will help to shape its students emotionally, intellectually, physically, socially, and spiritually. Notre Dame Academy is a safe, faith-based, learning environment. The entire school attends mass at Sacred Heart Parish on the first Thursday of each month. The school is dedicated to teaching children Christian principles rooted in the traditions of the Catholic faith. The faculty and staff members are devoted to setting high teaching standards and expectations for all students, encouraging them to be responsible, prayerful, and moral. Sister Donna Banfield, Principal of Norte Dame Academy, is a Sister of the Blessed Sacrament. The religious order was founded by Katherine Drexel, who dedicated her life and vast fortune to the service of Black and Native Americans in the United States. Before coming to Savannah in July of 2012, Sister Banfield taught at St. Charles Borromeo School in Harlem, New York for over twenty years. Banfield has a Masters in Educational Leadership from the college of New Rochelle in New York State and over twenty-five years of experience in the field of Education. Notre Dame Academy is a community working together, valuing children and teaching Christian values. The students show their love for Christ and their community by looking after one another, treating everyone with respect, caring for the environment and doing their best every day. NDA has a curriculum that follows the guidelines set by the Catholic Diocese of Savannah. Notre Dame teaches Religion, Reading, Mathematics, Science, Social Studies, Physical Education/ Health, and Art/Music. It also offers some special activities to its students. There is morning and after school care, basketball, and African drum classes. Notre Dame Academy also offer an afterschool program entitled SEEDS (School Enriched Exploration Discovery Sports). The program is an innovative, extended day program provided to students of Notre Dame Academy. p.m. and Friday from 3 p.m. until 5pm. When school is dismissed at 12:30 p.m., the program ends at 3 p.m. SEEDS provides a fun, safe and nurturing environment for children Pre-K through 8th grade. The program includes structure and organization, homework, tutoring, art, music, sports, a scouting program, playtime, snacks, and other instructional programs. Some special classes with outside instruction do require a fee. Notre Dame Academy has special science labs that were donated to the school for 6-8th grade students. 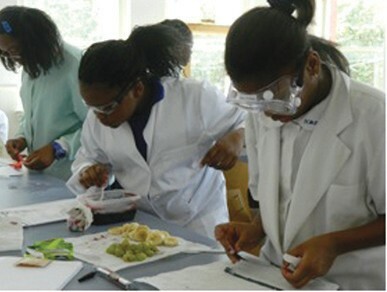 In these labs, the students are gardening, dissecting insects and much more. For the gardening, there is a greenhouse. What the students are learning here makes it easier for them to transition to high school. During the Easter holidays, the children performed and re-enacted the three Stations of the Cross: the suffering, the crucifixion, and the resurrection. Most of Notre Dame’s students are noncatholic and offer affordable tuition rates and scholarship assistance. Providers include the Diocese of Savannah, GRACE Scholars, as well as independent Student Scholarship Organizations (SSO’s) such as ARETE and AAA, among others. Notre Dame Academy accepts any organization’s scholarship for qualified students. ARETE Scholarship funding, allows full scholarship funding, which comes from a separate entity. ARETE and AAA are independently administered SSO’s each with its own assessment and qualification procedures. In general SSO’s are available to students transferring from public schools to a private school (or entering Pre-k or Kindergarten). After earning an SSO scholarship, you may continue to receive it in subsequent years, as long as you still qualify and funds are available. Sister Banfield, who is available year-round, has the vision for Notre Dame to increase enrollment, but not lose its intimacy. She also wants to enlarge the academic program, which would allow students to strengthen their skills, enhance their spirituality, and acquire the life skills that will prepare them to become responsible adults. The Board of Trustees, which helps to generate finances for the school is in the process of being restructured. It is tapping into community leaders who are interested in moving Notre Dame forward. This year’s graduation is June 3, 2013 and has some graduates with very bright futures. Three of the female graduates have been accepted into St. Vincent’s and Israel Jones, the son of Clive and Sonya Jones, has attended Norte Dame from Pre-K to eighth grade and will be attending BC in the fall.